It is always a good idea to have the proper equipment prior to camping of any kind. However, extreme camping in some of the most inhospitable locations on the planet requires more in-depth planning for sheer survival. Camping equipment in these areas requires more than a simple tent and a cooler full of hotdogs and chili. There is a reason why they are called the “wastelands.” Not much grows in these areas and finding food, shelter, and water may be quite difficult. For example, the Wyoming plains are very unforgiving to those attempting to scratch out survival. The winters can be grueling cold as the wind tears across the plains in excess of 50 miles per hour. The summer time isn’t much better as little rain falls in this area and can create a desolate picture of hills and dry sagebrush. To survive wasteland areas such as this in the summer, proper gear is needed in addition to your standard camping equipment. 1. First Aid – One of the most important items you would need for extreme camping is a form of first aid. Regardless of how careful you may be, accidents do happen and immediate treatment of wounds could stave off a serious infections. The Life Gear LG492 survival kit pack is loaded with items you would need for survival and emergency situations. Flashlights, LED glow sticks, directional compass, and more accompany the first aid kit to cover your basic needs for outdoor survival. 2. Water Needs – Water is the basis of life and without it, survival would be next to impossible. With the Datrex Emergency Survival Water Pouch kit, you can store 64 pouches of water each containing 125ml for up to five years. This is an excellent item to have in a vehicle or camping supply crate. If your water supply is exhausted and/or scarce to find, this kit can keep you hydrated for a great deal of time. As each pouch is individually wrapped, they can be separated and added to backpacks, pockets, and more for further exploration and ranged expeditions in which the entire case isn’t ideal to carry. 3. Survival Knife – What camping equipment would be complete without a survival knife with 16 functions attached? The Royal Crest Multitool Knife has the most used and favored additions any survivalist would want in a pocket tool. Made of 420 stainless surgical steel, this knife can become a heavily used item while camping and at home. 4. Cooking – Sometimes, propane and wood are hard to come by in order to cook food. The portable Sunflair Solar Oven harnesses the power of sunlight to cook your meals much like an actual oven. These solar ovens require no other fuel except the power of the sunlight and can reach temperatures of up to 250 degrees Fahrenheit – far past what is needed to cook meat. If igniting a fire is beyond your capabilities because of circumstances, put the sun to use. 5. Lighting – When night falls, having proper lighting could prevent falls and help you avoid other unseen obstacles. By using a solar rechargeable and hand-crank powered lantern, you don’t need to worry about fuel use and can illuminate the area with several bright LEDs in every direction. This unit can be sitting outside throughout the day charging from the solar energy, or it can be charged by the built-in hand-crank. You should always carefully investigate the area you are planning on conquering. Climates, plant and animal life, seasonal obstacles, and more can be determined and help you plan on proper equipment to ensure your survival. It may be extreme camping, but it doesn’t have to be akin to suicide. Jason Miner an expert freelance writer loves writing articles on different categories. He is approaching different bloggers to recognize each other's efforts through www.blogcarnival.com. He can be contacted through e-mail at jasonminer8atgmaildotcom. 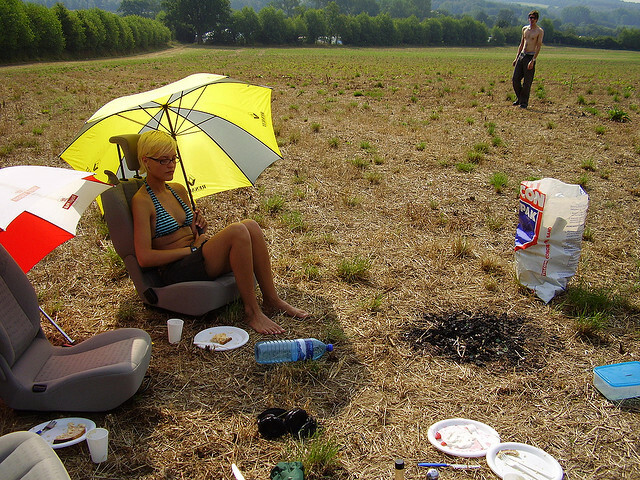 This entry was posted in Bizarre, Extreme Camping, Featured and tagged extreme camping, Wasteland Camping. Bookmark the permalink.